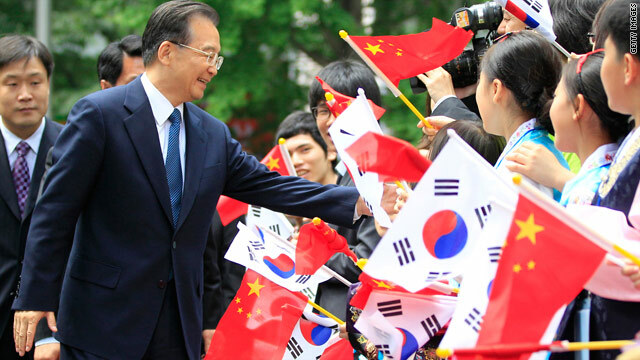 Chinese Premier Wen Jiabao is welcomed by children waving the flags of South Korea and China during a visit to Seoul on May 29. Beijing, China (CNN) -- When Chinese premier Wen Jiabao visited South Korea last week, politicians, diplomats and reporters in Seoul parsed his public statements, looking for indications on China's stand on the sinking of the South Korean warship Cheonan. The ship went down on March 26, killing 46 sailors. South Korea says the North torpedoed the ship. North Korea has repeatedly denied the allegation. The incident has since become an urgent security dispute in the region that could potentially escalate into armed clashes, according to analysts. The South Koreans hoped China would express outrage and condemnation. Speaking in Seoul, Premier Wen offered his condolences. "The sinking of Cheonan is an unfortunate incident," he said. "We understand the sorrow of the South Korean people, especially the victims' families." However, he stopped short of condemning the North for the incident. Instead, he said China would take an "objective and fair judgment based upon the facts." He called on all parties to remain calm in order to avoid possible conflicts. "If clashes flare up," he said, "the worst victim will be South Korea. And China, too, cannot avoid misfortune." China is already caught in the diplomatic crossfire. South Korea has been trying to convince China that North Korea was the culprit. It wants to penalize the North at the United Nations Security Council with a condemnatory resolution and harsh sanctions. Getting China's backing is crucial because it holds veto power as a permanent member of the Security Council and it is a close ally of North Korea. But political observers say China is reluctant to take sides. "One gets a sense that the Chinese officials just wanted it to go away," said a Western diplomat in Beijing who requested anonymity. "They did not want tensions to escalate." Premier Wen indicated that Beijing remains open to reviewing the results of the investigation. Wenran Jiang, a political science professor at University of Alberta, said the Chinese leader's equivocal position was understandable. "By not choosing sides, the Chinese leadership would like to remain as mediators," Jiang said. "It has clearly concluded that the tension may lead to great conflict and even an all out war. That is in no one's interests." A Chinese government official in Beijing, who spoke on condition of anonymity because he is not authorized to speak on the subject, said China's goal is consistent. "We want peace and stability in the region," he said. "We don't want one incident, tragic and outrageous as it is, to derail us from this long-term goal." He said China still believes the only platform that has a chance of succeeding is the six-party talks, even though he acknowledges that it is, at the moment, "on the brink of death." China has hosted the talks, which bring together the two Koreas, the United States, Japan and Russia to negotiate the roll-back of North Korea's nuclear program. The closed-door meetings, which began in 2003, have been stalled for more than a year after North Korea walked away, angry about stringent U.N. sanctions backed by China. Still, China remains the only party closely engaged with North Korea. Last month, Beijing hosted a rare visit by Kim Jong-Il. During his five-day visit, the reclusive leader met China's top leaders and visited two coastal cities known for their frenetic international trade and commerce. Some South Korean politicians were reportedly upset that China had hosted Kim while the Cheonan incident remained unresolved. This is not the first time North Korea has put China in a diplomatic quandary. Over the past two decades, China has carefully juggled its ties to North and South Korea, balancing strategic and economic interests with the bitter rivals. China is now South Korea's biggest trade partner. At the same time, it remains North Korea's closest political ally and largest trade partner. China and North Korea famously describe their special ties as "close as lips and teeth" -- one cannot exist without the other. They share a long border and have fought side by side during the Korean War (1950-1953), which ended with the division of the Korean peninsula. China's trade with the North is tiny compared with its robust economic ties with the South, but it is critical for the survival of Kim Jong-Il's regime. A Large quantity of North Korea's daily oil supply and food imports come from China. The U.S. and South Korea hope China will use its economic and political leverage as a "stick" to change North Korea's behavior. But China does not see itself as a global policeman, analysts say. It abides by its foreign policy mantra of non-interference in other countries' internal affairs. "We want to play a constructive role," said the Chinese official in Beijing. "We want to subtly encourage North Korea to reform and open up even if slowly, step by step. But it's all up to them to decide." He said China fears that diplomatically isolating and financially squeezing North Korea will backfire because it could lead to the collapse of the fragile regime, trigger civil unrest and lead to an influx of millions of North Korean refugees on China's border. Instead of waving the proverbial "stick", he said, "it's better to dangle incentives, such as economic aid and security guarantee." The Chinese official insists there are no better ways to resolve the Cheonan conflict than through dialogue and diplomacy. "A military strike (against North Korea)? That would set off a violent reaction and risk an all out war. New sanctions? North Korea has survived them all." He said that if North Korea is again pushed in a tight corner, it could resort to desperate measures, such as conducting more missile and nuclear tests or resuming full-scale operations at its Yongbyun nuclear facility to process more weapons-grade plutonium. "North Korea has little to lose," he said. To many Chinese strategic thinkers and policy makers, long-term solution of the Korean conflicts require a combination of domestic reform in North Korea and persistent multilateral negotiations, such as the six-party talks. "Whatever next step emerges, it is important that all other options have been tried and exhausted. The top priority is for the two Korean sides to sort out their differences," said Zha Daojiong, a political science professor at Peking University.